If you don’t already read Richard Thompson’s Cul de Sac, you really should. If you are among those who don’t, I should clarify that this is not the singer-songwriter Richard Thompson. This is the creative genius behind Richard’s Poor Almanac and this new, daily strip. I say “new” because it’s one of the newer creations on the comics page, but it’s actually been out for for a little while: it began as a weekly strip in the Washington Post in 2004, and went into syndication in 2007. And I say “genius” because this is one of the strips that will, in the future, be regarded as classic. It’s up there with George Herriman’s Krazy Kat, Crockett Johnson’s Barnaby, Walt Kelly’s Pogo, Charles M. Schulz’s Peanuts, and Bill Watterson’s Calvin and Hobbes. It’s that good. Cul de Sac is funny, but is character-driven rather than gag-driven. The humor develops from Petey, the anxiety-ridden comic-book obsessed older brother; Alice, the force of nature that is his younger sister; Ernesto, who may or may not be imaginary (Petey isn’t sure); Dil, who has thus far survived his older brothers’ many experiments; and many others. I confess that, when I began reading it last year, I grasped that it had a unique point of view, but I didn’t quite “get it.” I was intrigued enough to stay with it, and — after a couple of weeks — it became my favorite strip. Indeed, when I’m traveling, it’s the one strip I make sure to read on-line, every day. So, stick with it. You won’t be disappointed. 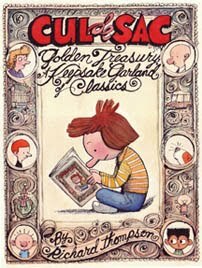 The third and latest collection, Cul de Sac Golden Treasury: A Keepsake Garland of Classics (2010), would make a good introduction — it collects strips from the first two volumes, Cul de Sac: This Exit (2008) and Children at Play: A Cul de Sac Collection (2009). Not incidentally, the first book features a foreword by Bill Watterson, who writes, “I thought the best newspaper comic strips were long gone, and I’ve never been happier to be wrong. Richard Thompson’s Cul de Sac has it all — intelligence, gentle humor, a delightful way with words, and, most surprising of all, wonderful, wonderful drawings.” So, if you don’t trust my judgment, then perhaps Calvin and Hobbes’s creator will persuade you to check out Thompson’s work? For your sake, I hope so.